When should we use one word, when should we use two, for terms like “log in”, “sign up”, “back up”, and the like? This is a hot topic among technical writers, UX writers, and any designers who use text in their products. How can we tell whether we should use one word or two? Even if we ourselves already know the difference, how can we teach other people, like the engineers, designers, product managers, and other people who work on our product interfaces and documentation? I’ve put together a presentation that explains a way to help ourselves and others decide when to use one word, when to use two. It’s a bit of fun, but with a serious goal. You can find the presentation on SlideShare: One word or two? How to teach the difference between “login” and “log in”, and other mind-bogglingly important compound words. This blog post contains some extracts from the presentation. The presentation shows a couple of slides containing a few sentences. Embedded in the sentences are some strings of repeated letters, like lllll or bbbbb. To play along, you’ll need to replace the string of letters with the terms “log in” or “back up”. Try speaking the sentences in your head., or even saying them out loud. 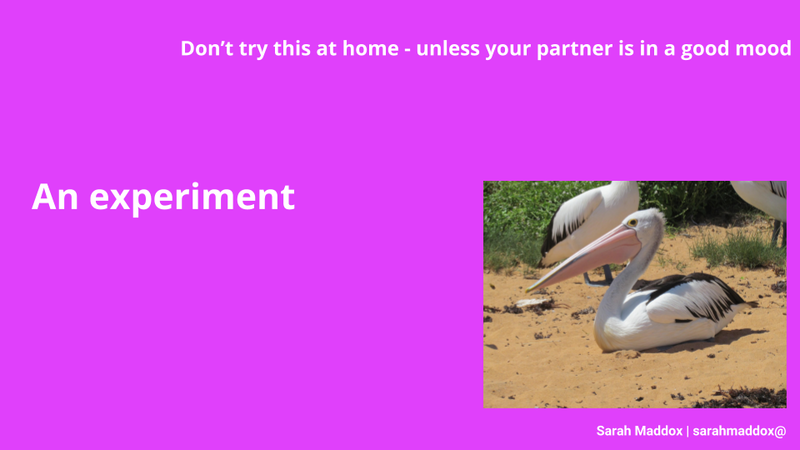 This is where the bit comes in about your partner needing to be in a good mood: you could even ask your partner to play along with you! 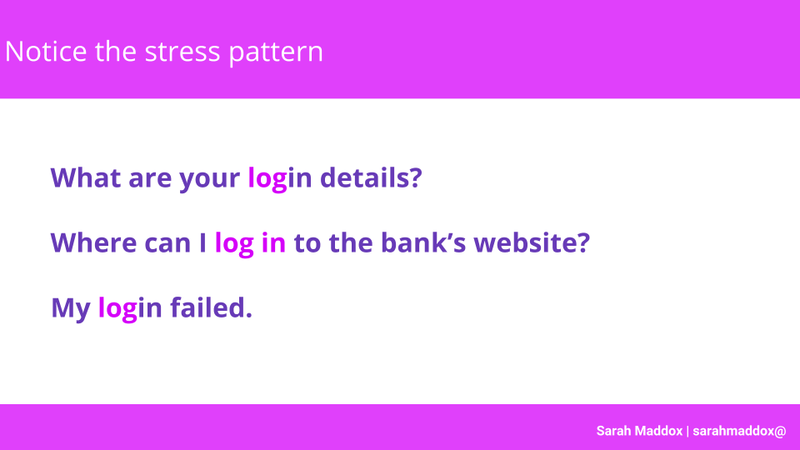 Did you notice any pattern in the way you pronounced the words “login” and “log in”? If you’re like me, your stress pattern in the middle sentence is different from the first and third sentences. In the middle sentence, we give equal emphasis to both parts of the phrase: log in. In the first and third sentences, we give greater emphasis to the first part of the phrase: login. 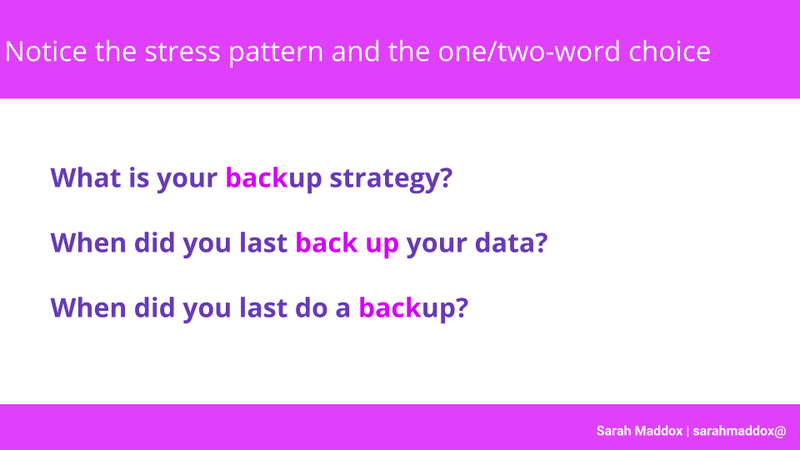 The stress patterns are the same for backup. In the middle sentence, we give equal emphasis to both parts of the phrase: back up; log in. In the first and third sentences, we give greater emphasis to the first part of the phrase: backup; login. And it’s the middle sentence that uses two words, while the first and third use one word. So, you can use stress patterns to decide whether to use one word or two. That’s one way of doing things, but what’s the theory behind it? If the phrase is acting as a noun, use one word. This includes cases when the phrase is used to qualify another noun. If it’s a verb, use two words. The presentation goes into more detail and includes some sources and additional reading. 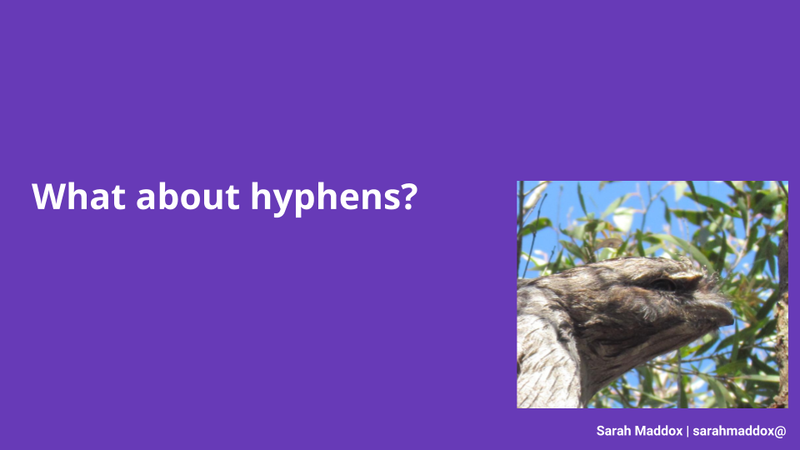 Yes, what about hyphens. 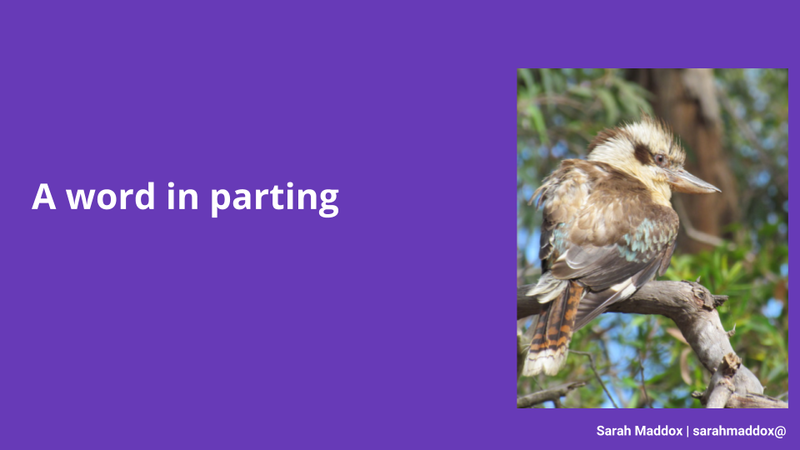 I think this is my favourite slide, because it shows a pic of a Tawny Frogmouth. They’re the coolest birds ever. The complete presentation is on SlideShare: One word or two? 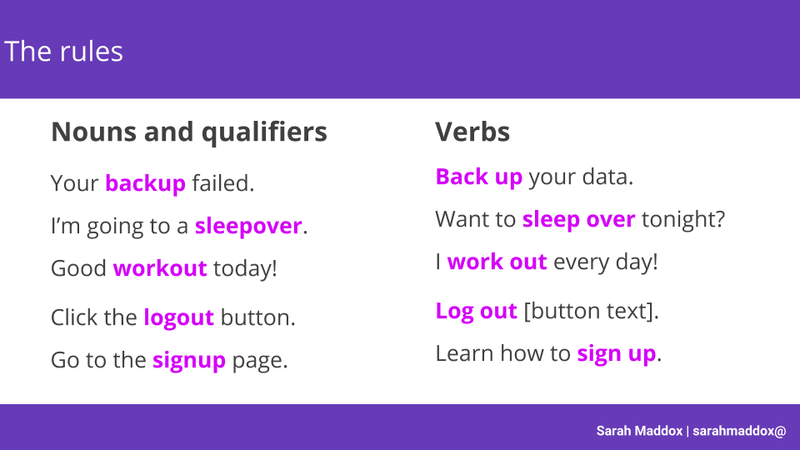 How to teach the difference between “login” and “log in”, and other mind-bogglingly important compound words. 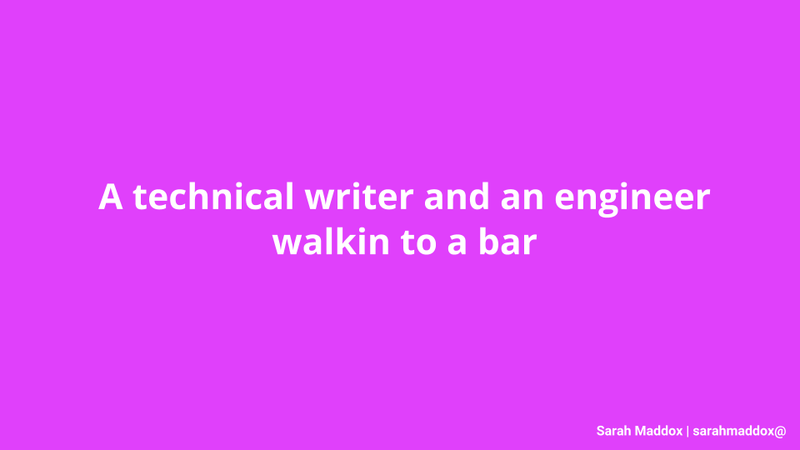 Posted on 20 May 2018, in humour, language, technical writing and tagged compound words, grammar, hyphens, log in, login, one word or two, spelling, technical communication, technical documentation, technical writing. Bookmark the permalink. 3 Comments. Thanks Joshua, I’m so glad it’s useful.